Lev Grossman’s 2009 novel The Magicians will be making its comics premiere under the BOOM! Studios banner in 2019, per THR. Lilah Sturges, author of Midwinter and The Office of Shadow, will be taking up writing duties and collaborating with Grossman, with Adventure Time and Night Owl Society veteran Pius Bak on art, and a cover from Steve Morris. The team won’t be retelling any old stories from the novels or Syfy show. 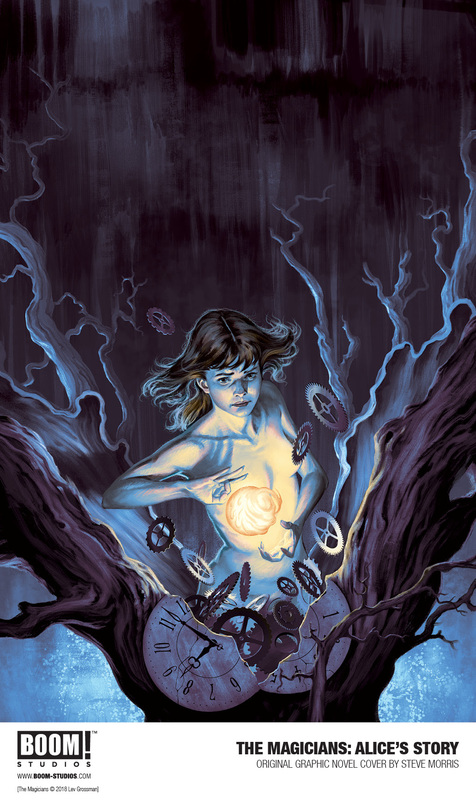 The new comic, aptly titled The Magicians: Alice’s Story, puts a new character in the spotlight. Sturges, who’s followed the series in all its iterations, sees Alice as a quiet main character whose decisions resonate throughout the rest of the universe. Even though she doesn’t get a lot of attention, Sturges sees her as hugely important for the world of The Magicians. Grossman, who describes himself as protective when it comes to his story, was pleasantly surprised: “[Sturges] kept opening new doors, and I’d look in and think ‘Oh, of course—that must have been there all along,’” he told THR. With the new format, the team aims for a true portrayal of magic. Bak and Sturges point out that comics are one of the few mediums in which fantasy can thrive, especially compared to live-action film and television. Look for a new pathway into The Magicians’ world next July, when Alice’s Story hits comic stands, and see Morris’ uncropped cover art below.